I am so glad I found this yoga session through travel2change. Julia ran such a great class! There was a large turnout with about 30-40 people. She did a great job keeping the difficulty level accessible for all ranges of yoga experience. 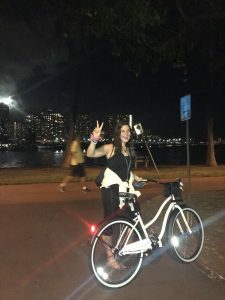 My classmate and I biked to Magic Island and showed up around 7:15. There were already about ten people there so the class was very easy to find. Just look for a group of people with yoga mats and little lights in the grass. 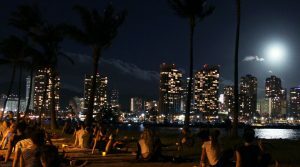 It looks directly over Diamond Head and is on the far left side of the peninsula, a bit before you reach the farthest point of the island. I would highly recommend getting there early to get a spot in the front. It is harder to hear in the back, but Julia did a great job of walking around while she was instructing so everyone could hear. Bring water and a yoga mat if you have one. I brought a beach blanket, but the wind would blow it around and it was a bit distracting. Near the end of the class, Julia had us do a group balancing exercise. At first I was uncomfortable with the idea of hanging on to total strangers. But by the end of the exercise, we were all laughing and I felt much more connected with everyone in the group. It turned out to be a really cool and bonding experience. At the end of the class, we had the opportunity to put the food for the food drive in a wagon. There was also a donation jar if you want an even easier way to contribute. 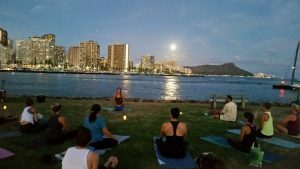 Whether you are an advanced yogi or have never stepped foot on a yoga mat, this class is perfect to connect with your surroundings and unwind by the water while helping those in need. 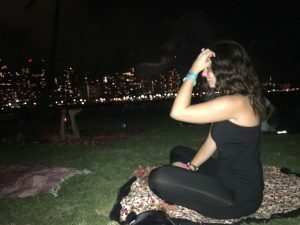 I was pleasantly surprised by how much fun I had and it was such a unique experience to do yoga at night under a full moon right by the ocean. Sign up for this event! You won’t regret it. View towards Dimond Head from Magic Island. Biking out to Magic Island. 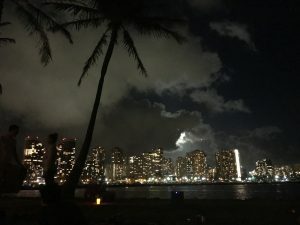 The moon shining over Diamond Head.